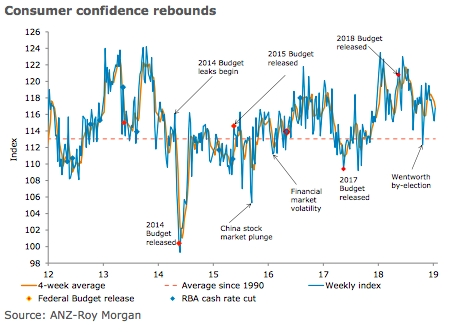 Australia’s ANZ-Roy Morgan consumer confidence was up 1.4 percent last week. Current financial conditions were up 2.8 percent, rebounding after three consecutive falls. Future financial conditions registered the fifth consecutive increase, rising 2.0 percent. Economic conditions declined, with current and future economic conditions falling by 0.6 percent and 2.3 percent respectively. There was a marked improvement in the ‘time to buy a household item’ index, with it registering 3.9 percent growth. This took the index to its highest level since the first half of October and above the long-run average. Four-week moving average inflation expectations were stable at 4.3 percent. "Consumer confidence was up 1.4 percent last week thanks to a good showing from the ‘financial conditions’ and ‘time to buy a household item’ indices. This increase reverses a good portion of the decline captured in the first survey of 2019 and consolidates consumer confidence at a level comfortably above the long-run average. The resilience shown by Australian households amidst weak global and domestic cues is encouraging. Robust job vacancies data may have played a role," said David Plank, ANZ’s Head of Australian Economics.